While other copycat bulbs may look similar on the surface, the Marinebeam products are brighter, last longer, and have better light quality than the others because of the technology we employ. Our Constant-Current chipset uses the newest wave-shaping technologies for controlling the current to the LED clusters for maximum output and the longest life, and without creating nasty Electro-Magnetic Interference (EMI). We would venture to say that 99% of the products that we see that are being sold as "marine lighting" are being controlled by a simple ballast resistor. Resistor controlled high-output LED bulbs generally have no place on a boat. This is because current is used to drive LEDs (not voltage). The more current, the brighter the LED, and the brighter the LED, the hotter the LED junction gets. The hotter the junction, the shorter the life. A resistor is fine at controlling current at a specific voltage, so if you design it for 12V input, and your voltage doesn't vary in the slightest, then you should be fine. In other words, you should be be fine if you aren't on a boat or live in a world of big battery banks, variable charging devices (alternators, solar panels, wind-generators) and so forth. Another interesting fact is that when controlling LEDs with a resistor sized for 12V, if the boat's voltage goes up 25%, say to 15V when charging, the current went up more like 35% because of the voltage drop inherent to the LED itself. You can say goodbye to an LED that has seen a 35% spike in current. To avoid this fate what most resistor bulb manufacturers do is to give themselves some headroom and to size the resistor for 14V, which is fine if it is to be used for a tail-light on little Jimmy's Honda, but when the voltage on the boat drops down to about 12 volts, the bulb is now 25% less-bright as it was at 15V. That won't work on a boat. To make matters worse, a resistor is painfully inefficient at its task because it controls the power by bleeding it off in the form of heat, and we are trying to avoid heat so that we can maximize brightness and LED life. We are also likely anchored in the tropics and want to stay cool. Eventually, every watt of power given to the bulb ends up as heat in the boat. Each 10 Watts equals about 34.4 BTU's . We have all heard the horror stories of the fellow boater who bought Chinese "tail light" LED bulbs on the internet or from that "ScamWOW" guy at a boat show only to have cold, clammy, blueish light for a short period of time before they gradually got dimmer and finally winked out. We here at marinebeam.com are weary of hearing these stories. This is why our focus is on selling current-controlled products using the latest converter technology. Some competitors now claim non-resistive constant-current control using inexpensive Buck Converters. Typical current-control methods using these inexpensive switch-mode converters can present quite a fire hazard, and can contribute significantly to both conducted and radiated Radio Frequency (RF) emissions, which can interfere with VHF, FM, SSB and GPS radios onboard. This can make these devices useless. This EMI is typically due to manufacturer's using standard LED driver IC's which create sharp spikes in the switching frequency wave-forms that emit RF into the air, and EMI through the wiring. 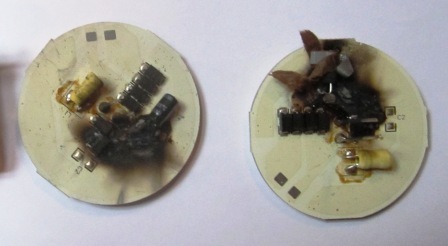 This problem is compounded by poor design of the typical LED emitter boards, where the circuit traces tend to work as mini-antenna. We address both of these important issues in our LED driver and board design. Because our LED arrays are meant to be used on boats, where RF interference can be catastrophic, Marinebeam is using the latest wave-shaping technologies to reduce any RF or EMI emissions. With smartphones, airplanes and automobiles now using high-performance LEDs for illumination and backlighting, EMI issues are being addressed more responsibly by the leaders in the industry. Marinebeam is leveraging the newest wave-shaping technologies emerging in these markets to ensure we have great performing low-EMI products for our boats. Learn more on our EMI page. Still not convinced of the fact that the cheap Chinese copies can be dangerous? Consider the Danish yacht that burned to the waterline in 2011 due to cheap LEDs catching fire, or these pictures sent to me by the crew of the historic J-Class America's Cup yacht, Shamrock V. They nearly learned the lesson the hard way when the cheap Chinese bulbs they installed literally exploded one by one. Look closely at the photos, and you will see that the force of the explosion literally blew the substrate apart. Without getting too technical, it is the most power-efficient way to close-loop the current that the LEDs in each cluster see. More importantly, it is the best and most reliable way to protect LEDs in the changing voltage environment that we find on boats. To maximize brightness and ensure a long life, we want to drive the LED at its design-forward-current regardless of input voltage, and we do not want to over-drive the LED whatsoever. The integrated circuit we employ in our constant-current products can provide this constant-current to the bulb from 10V - 30V. What this means is that the bulb is absolutely as bright at 10V as it is at 30V, and the LEDs are being protected regardless of the voltage. The Marinebbeam constant-current driver has a current accuracy of ±5% and 96% efficiency, which means it will improve the inter-lamp luminance matching in our LED arrays, which gives you a brighter more color-consistent lamp, and a longer bulb life. LED's have just recently become suitable for replacing the incandescent light bulbs used for illumination on your boat. Technology is rapidly improving, not only in the light output, but also in output color. This is due, in some part, to improvements within the manufacturing process, but, the real gains for us boaters have been in the thermal management improvements and LED driver technologies that are being developed and incorporated into integrated circuits small enough to live withing the form-factor of a small LED bulb. The current efficacy benchmark for LED replacement bulbs in a warm white color is hovering around 60-80 lumens per watt. For each gain in light output, we create an even bigger thermal management issue. You see, the solution isn't necessarily making a brighter LED (that has been done), the problem is being able to give it a high driving current while keeping it cool, all without stepping over the boundaries of the form factor of the bulb we are trying to replace. An interesting fact about LED lighting is that for every 10° C increase in junction temperature over its design threshold, the life of the LED is cut in half! Another way to say it is that you can give any LED a large amount of current, and it will be very bright for a very short time! What are Surface Mount Device (SMD) LEDs? SMD LEDs are flat LED chips which bond directly to a highly thermally-efficient aluminized substrate (printed circuit board). Unlike traditional parallel leg through-hole type LEDs, they are not restricted by having to dissipate their heat through wire legs to the substrate. SMDs, in addition to being designed to be very thermally-efficient, transfer their heat directly to the substrate over a wide surface area, and can be driven much harder. Therefore they are much brighter than traditional LEDs. They also are not contained within the plastic domed capsules like traditional LEDs, further improving their thermal efficiency. The SMD LED used in our high-output products generate half the junction temperature compared with their traditional LED counterparts, at the same current. Because they are brighter than traditional LEDs, we need fewer LEDs to generate the same light output. This is helping us make brighter clusters within the constraints of the form-factor we are trying to accomplish. Constant-current drive technology is important when driving the latest high-power LEDs. It maximizes life, reduces heat, and and provides the brightest and most consistent light output possible. The latest SMD LEDs coupled with the constant-current drive topology, and engineered thermal substrates, allows marinebeam.com to offer the boating community a top quality product at an attractive price that we know will satisfy.